Underneath the arches, tucked away on a side street on the approach to London Bridge Station, sits the new O’Meara complex, housing a music venue with ornate walls and ceilings that loom like they have been there hundreds of years. Tonight, Julia Jacklin is using the audience as guinea pigs as she plays tracks from her upcoming second album Crushing due in February. It’s a small, intimate affair, but packed to the rafters on a mild night as Christmas draws closer. She has clearly brought the warmer front over from her native Oz but that just means the clouds burst and drench the streets of London, but the room is hot. Launching straight into the first cut released from the new record, the understated but powerful “Body” telling the tale of an unhealthy relationship culminating in an incident on an aeroplane. She confesses after that tonight was the first time it had been played live, but it held its intensity that the recording exudes. Admitting nerves at laying bare the new songs for the first time she settles in with older tracks “Motherland” “Don’t Let the Kids Win” and “Leadlight” but soon gains confidence with newbies “Pressure to Party” and “I Don’t Know How to Keep Loving You”. The contrast between her two styles of singing is setting her apart from her peers, one moment she is delicate and fragile and the next fiery and imploring, new single “Head Alone” the perfect example “I don’t want to be touched all the time, I raised my body up to be mine”. Anomalies in her hand written set lists mean they start deviating from the order and there are a string of new ones. “Good Guy”, “You Were Right” and “Turn Me Down” are rattled off with the panache that betrays their debutante status, despite pausing after a few bars to explain that there are three sections and not to clap when the first ends. It’s not the end of the song. So much for the difficult second record, already on first listen they more than stand up with her debut. Experience has strengthened her songwriter muscle and they shine in this setting. There’s always been a simplicity to the song structures and chord progressions that her voice lifted up but these songs are more complex and nuanced or have the swagger to be a two and a half minute pop bullet. She concludes with the epic, sprawling “Hay Plain” from her debut L.P Don’t Let the Kids Win and then she is gone. Her short run of three dates to road test the new material takes in Manchester and Glasgow but she is back next year for a full tour to coincide with the album’s release. On this evidence, she truly is “Coming of Age”. 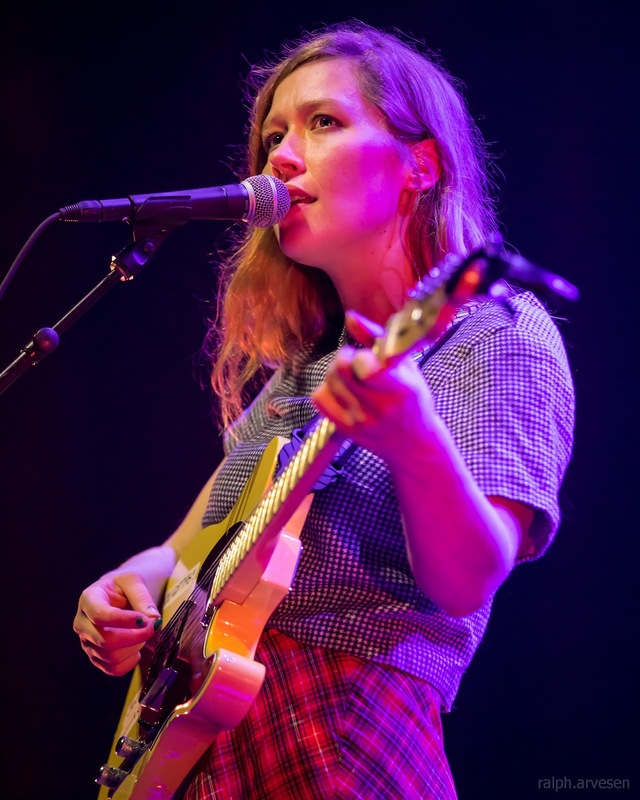 Image from Julia Jacklin performing at the ACL Live Moody Theater in Austin, Texas on September 18, 2018.